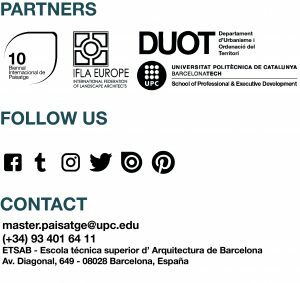 2013 – 2014 – Master in Landscape Architecture Barcelona – Universitat Politècnica de Catalunya – 35ª EDITION. CITY VS. LANDSCAPE? Notes for a projective genealogy. WALKING EXPERIENCE. Discovering by walk the compact city of Manresa. 100 KM 100 LOOKS. A pilgrim’s landscaper test on the Via Francigena and Camino de Santiago. ACTIVE MAP. Mapping as a tool for project.